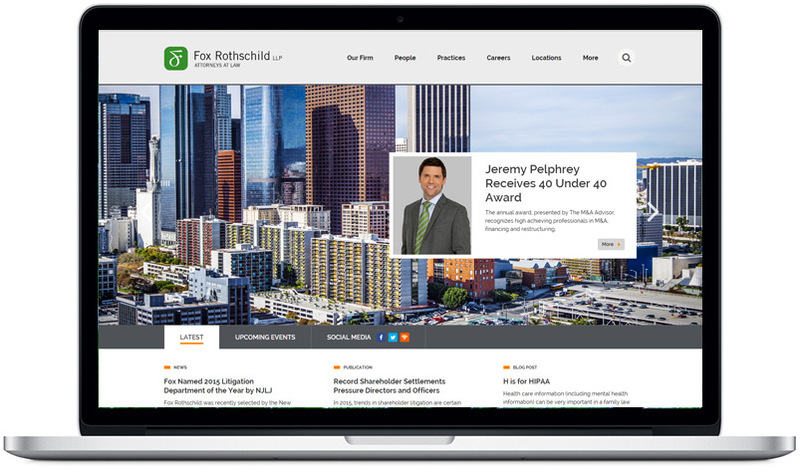 Fox Rothschild, an AMLaw 100 firm with more than 650 attorneys in 21 offices coast-to-coast, re-launched its website with a new, next-generation content management system (CMS) created by Great Jakes. Attorney Microsites – The newly launched Fox website features Attorney Microsites—a unique approach to lawyer bios that Great Jakes pioneered. Attorney microsites are, essentially, small websites for each attorney that fit within the firm’s larger website. Examples of how some of the firm’s attorneys are using the attorney microsite functionality include Josh Horn and Aaron Weems. Wider, More Impactful Pages – The pages of the website were widened to maximize the impact of the website on today’s larger, higher-resolution monitors. As part of this page-widening project, other design tweaks were made to the site, including (a) the full redesign of the homepage and several other key pages, (b) the selection of new typefaces, and (c) the adoption of a new portrait photo style. Massive Data Migration – The development of the website also required a massive data migration effort by Great Jakes’ programmers. Over 10,000 records were moved from the firm’s old Ektron system to the Great Jakes Rainmaker CMS.